The new Sony Bravia ad has been carefully nurtured and seeded to generate intense word of mouse before launch. 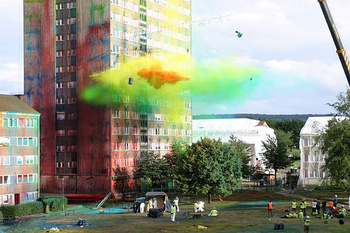 Getting Jonathan Glazer to direct, using a record number of explosives, slowly revealing the location in the press, releasing teaser photos of the set: it has all been carefully executed to generate excitement online. And boy has it worked. With a careful strategy, an exciting ad can still make the news. But perhaps the more interesting point is that if you can get bloggers excited about something, seeding is easy. Get something listed on Boing Boing or a.n. other high profile blog, and watch it spread throughout the blogoverse. This is a post about posting about a post about posting about a...see the power of metablogging! via - take your pic: here and here and here and here and here and here and that. UPDATE: This interview on IF with David Patton from Sony details the strategy to engage the online community in an open and transparent conversation with the brand. 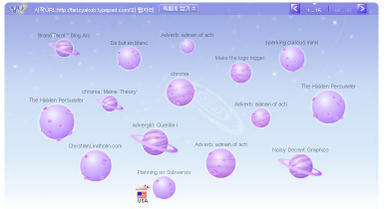 Yahoo in Korea have released a tool called Webzari that visualises inbound links to any web page. This is a snapshot of the blogoverse that TIGS lives in. I wonder what he would have thought of Blink? 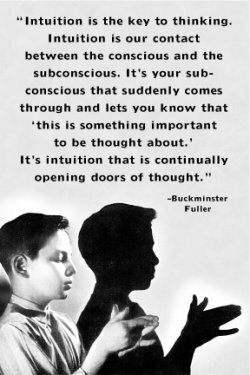 Buckminster Fuller was a legend. He dedicated his life to proving that an individual could make a difference to the world and created geodesic domes that happened to share the same exact structure as Carbon C60 molecules - now known as Buckminsterfullerene. I love the idea of being a tremendous bundle of experience. Anyway, on this pitch a lot of people keep talking about authenticty. Consumers are crying out for brands to be authentic and that. There seems to be a sense that authenticity is about real life, grass roots, non-commercial stuff. But how can a brand be non-commercial? I think that being authentic as a brand is really simple. Stand for something, establish a consistent mode of behaviour and then express it through everything you do, communications and commerce. It's when you say one thing and do another that you stop being authentic. PS. When you try to fake a grass roots movement, it's called astroturfing. Brilliant. The ever gracious Mr Davies is offering up some (open source) thoughts on the evolving intermenet tonight at W&K in London (in a typically modest fashion). I'm going to be there - come say hi if you are too. We could all go for a drink after in the sunshine. 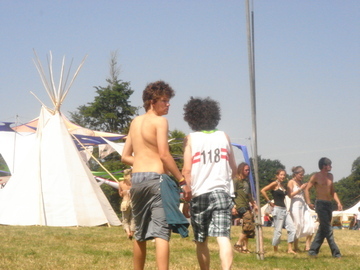 Spotted at Glade Festival, July 2006. 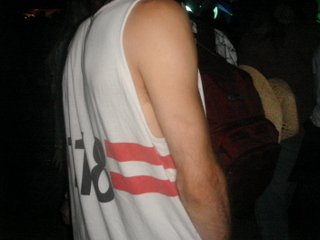 OK so I'm slightly biased as I used to work on this but I still think the 118 vests were brilliant. Being a geeky type, I often get asked about virals and that. To which I tend to reply viral is a thing that happens, not a thing that is. On the website for Coca-Cola's answer to Red Bull, Relentless, they have even labelled their movie clips as viral 1, viral 2 etc, which demonstrates a truly baffling misunderstanding of how viral communication works. Particularly as nothing about the movies makes them worth sending on. Let's say it together - viral is a behaviour! Specifically, it's a parasitic behaviour - where the commercial / brand message is piggybacking something else that is being passed on - usually entertaining content / social currency. Which brings me back to vests. The 118 118 launch campaign happened 3 years ago this summer and it contained a number of viral elements including web films and that. But the bit that was most viral, where consumers became the communication vector, was the vests. In this instance, they aren't even consciously passing anything on - they are just wearing a vest. People nicked the vests and like the vests and wear the vests when it gets hot. And so the virus continues to spread - anywhere hot that people congregate - they appear. I still see them at festivals all over England. I've even seen one on Bondi beach in Sydney. That makes it a pandemic. 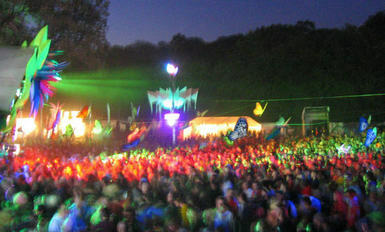 As part of my ongoing investigation into liminal spaces, I'm off to the Glade Festival. Purely for scientific purposes you understand. Cultural anthropology and that. 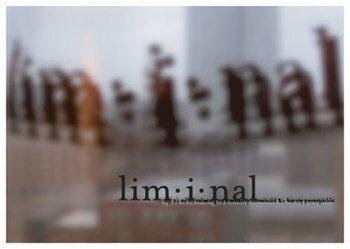 I've been thinking about liminal spaces. I stole the term from the delightful Watching the English by Kate Fox. (I would suggest that this is essential reading for anyone trying to understand people or consumers or anything at all in England). It's a very funny and very clever book: it unpicks the underlying rules of social grammar that dictate English behaviour and anyone who lives here will recognise them instantly when reading it, in particular the Importance of Not Being Earnest rule, which helps explain our pathological reliance on irony. Ms Fox is an avid people watcher, as social anthropologists tend to be, and spends a great deal of time in pubs, covertly noting down conversati0ns and behaviours. What she discovers is that pubs are liminal spaces - literally places where the boundaries blur and normal social rules are over turned. So at the bar in a pub you can talk to a random stranger and not get hit. People interact. And you don't have to be drunk. Although we do use alcohol to facilitate this process. And this also reminded me of the semi-hysteria the crowd experienced at the Fuerzabruta show at the Roundhouse in Camden. There was a communal sense of well being and a breaking down of barriers that typifies a liminal space. And then I started thinking, wouldn't it be cool if a brand experience was like that? I've been to quite a few and people tend to co-exist at these things as there is no central, collective experience. But if a brand could curate a social experience in a liminal space, that was somehow more than a show or a festival - that was an immersive, collective transgression of the normal rules of social behaviour, wouldn't that be an incredibly powerful driver? As a teenager, I recall going to my first gig. I had the record and had listened to it many times. But the experience of the gig crystalised something in my relationship with band - I became a fan so that even now, 14 years later, I will defend The Smashing Pumpkins to anyone who dares challenge their geek rock supremacy. Couldn't the right brand experience turn consumers into fans? Taking my cue from the excellent Diablogue, I'm not going to comment on this Titanium Lion controversy. But this is the home of stolen genius. So I will let you make up your own minds. The only winner of the Titanium Lion this year was a company called Design Barcode. They design barcodes. Realising that a bar code scanner only reads a thin strip of the code, the went about making them pretty. I happen to really like their designs and I think it is a very cool idea. “When Dan Wieden conceived the Titanium Lion, it was to celebrate something bigger than a category like film or outdoor. It was about rewarding monster ideas. It recognises and rewards the brave thinkers who are reconsidering the way forward, who are breaking the rules – even rules set down by famous award shows. As a recipient of the first Titanium Lion, I’m glad to help carry on its vision”. 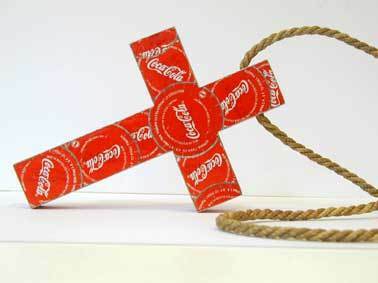 The thing that we’ve chosen we’ve never seen before and we think transcends even an ad or a piece of communication, it will lift the world, lift people, so in some ways it is even more powerful than some of the past Titanium winners. And I agree that possibly the biggest issue in the industry is the value of ideas: what are they worth and how can you own them? Although I'm not certain that anything that is awarded at Cannes is likely to lift the world. All good. Until you see this or this or this . 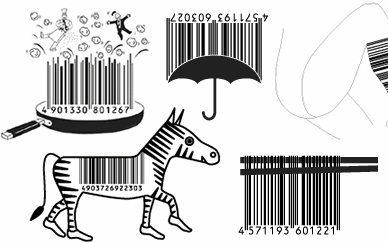 Now, I believe that Genius Steals - I have the upmost admiration for the Barcode Design and I like their work. But if the Titanium is all about being new and intellectual property and trademarked and that - shouldn't someone have checked? 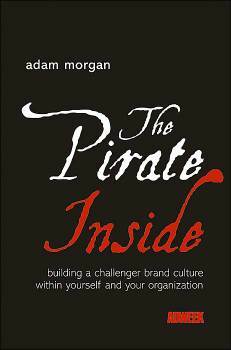 I saw Adam Morgan, champion of challenger brands, author Eating the Big Fish and The Pirate Inside give a talk last night. 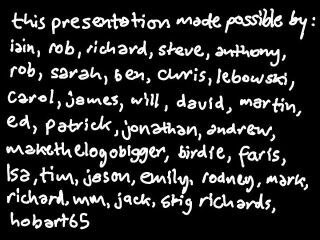 It was very good - a case study in how to use illustrative annecdotes to communicate your points - but there was one bit I particulary latched on to: a concept he called Creative Tenacity. This interested me for two reasons. It means finding a better way of getting through - to someone, to an organisation - if someone doesn't get your point, find a better way of communicating it. If someone slams the door in your face, don't keep banging on it - find the window. The first few times he said it, I thought he meant having the tenacity to push through good creative ideas, which isn't what he meant - creative tenacity is a noun phrase in this context [be creative about your tenaciousness] - but because I work in the communications industry my brain parsed it incorrectly - creative has a slightly different, and in fact, narrower meaning for me than it used to have. When I hear no, I take it as request for more information. The second thing was frankly a little worrying but an important reminder of how much what you do channels how you think. Why are pirates so brilliant?